During the holiday season, it can be difficult to find a balance between delicious and unhealthy when it comes to food. One recipe that is both very flavorful, but still healthy, is one for baked zucchini which I found in Vegetarian and Vegetable Cooking. I didn't know that I liked zucchini before I tried this recipe, but since pretty much everything is good when there is cheese involved, I decided to try it. It's a bit early, but if one of your New Year's resolutions is to eat more vegetables, this would be a good start. Also, I think it would be a good appetizer for a Christmas dinner especially if you cut each zucchini in half. 2. Cut 4 rectangles out of foil, one for each zucchini, and brush olive oil on each rectangle. 3. 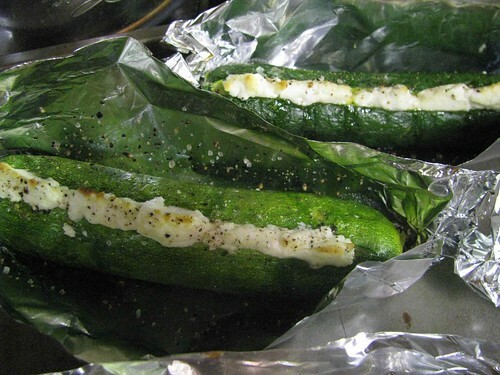 Make a thin slit along the middle of each zucchini, and place zucchini on the rectangle of foil. You'll want to make sure that the slits are wide enough to accommodate the amount of cheese you plan to place in them. 4. Place bits of goat cheese into the slits. (I used a lot in each!) Sprinkle with olive oil, black pepper, and salt. 5. Wrap each piece of foil around a zucchini. Put on a baking sheet, and bake for about 25 minutes.